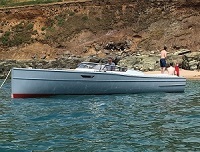 Nigel Irens, a leading yacht designer, recently delivered a fascinating 2019 Hanson Lecture entitled ‘Slippery Boats’ to a 60-strong audience at CA House. Irens is possibly best known in yachting circles for designing Adventurer, a 34.4m (113ft) trimaran motor yacht that completed a record-breaking global circumnavigation in 1998 – the first boat voyage around the world to take less than the 80 days of Jules Verne’s classic novel. He was also the designer of another famous record-breaker, B&Q, the 75ft trimaran in which Ellen MacArthur broke the world record for a solo circumnavigation in 2005. Nigel Irens has spent a lifetime making offshore racing trimarans make best use of the wind to steal the march on the competition, but now he has turned his attention to finding ways to re-work some of that ‘slippery’ technology in such a way that a quieter, more frugal motor boat might find favour amongst those who put to sea for the pleasure of the voyage – and not just the to meet the perceived imperative that getting from A to B needs to be achieved as quickly as possible. His lecture set out to explain how this objective might best be achieved. Another much anticipated part of the evening was the presentation of the 2018 Log Competition prizes. The annual Log Competition is one of the most important events in the Cruising Association’s calendar and dates back as far as the 1920s, awarding members with prestigious trophies for the best log of a cruise carried out in the most recent season. 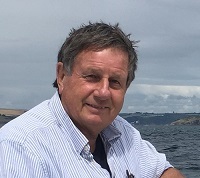 The judge for the 2018 Log Competition was Yachting Monthly Editor Theo Stocker. Members can view the winners and all log entries here.